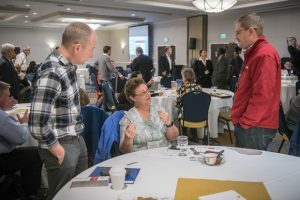 The Agriculture Law Education Initiative’s (ALEI) third annual Agriculture and Environmental Law Conference delivered another opportunity for attendees to learn from and engage with experts about the agricultural and environmental laws that affect Maryland’s agricultural producers. Over 100 guests at the November 17, 2017 program at the Doubletree Hotel in Annapolis heard from regulators, industry and advocacy organizations, and educators about laws currently affecting Maryland’s farmers, and from policy experts about what the future may hold for conservation efforts under the much-anticipated 2018 Farm Bill. Kelley Poole, Vice President of Government Affairs for the Organic Trade Association, and Alison Howard co-owner of Homestead Farm kicked off the conference with a discussion of the challenges and benefits of organic farming, and a review of the recent complaint filed against the USDA concerning organic livestock and poultry standards. Both speakers emphasized the importance to the organic industry of maintaining the integrity of the USDA’s organic seal, and the efforts by the agency and industry to crack down on fraud within the industry. ALEI’s Senior Legal Specialist, Sarah Everhart, and Dr. Terron Hillsman, State Conservationist with the USDA Natural Resources Conservation Service, then dug into the impediments to improving soil health on leased land, and how farmers and landowners can use lease agreements to ensure conservation practices improve soil health on leased acres. Dr. Hillsman pointed out that because 42% of farmland in Maryland is leased and restoring soil health can be a years-long process, it is important for landowners and lessees to work together to develop leases that benefit both parties through supporting good soil health on the land. Everhart stressed that communication and a written lease that has at least been reviewed by an attorney is key to avoiding potentially costly misunderstandings between landowners and lessees. Hans Schmidt, Assistant Secretary for Resource Conservation at Maryland’s Department of Agriculture (MDA), provided an update on recent developments in Maryland’s Nutrient Management Program, and described how growers can best prepare for a Nutrient Management records audit. Attendees then heard from MDA’s State Veterinarian, Dr. Michael Radebaugh; Colby Ferguson, Government Relations Director for Maryland Farm Bureau; and Betsy Nicholas, Esq., Executive Director of Waterkeepers Chesapeake and founder of Fair Farms, about the new legal framework for administering antibiotics to animals. The panelists talked about USDA’s new Veterinary Feed Directive and Maryland’s Keep Antibiotics Effective Act, passed this year, and with which farmers must comply by January 2018. Secretary of Maryland’s Department of the Environment Ben Grumbles gave an overview of how Maryland’s agricultural producers are preparing for climate change. The Secretary stressed that Maryland approaches climate change from a risk management perspective; focusing on adaptation, resiliency and preparedness, not just on mitigating greenhouse gas emissions. The keynote panel, Paul Wolfe, Senior Policy Specialist for the National Sustainable Agriculture Coalition, and Matthew Teffeau, Director of Government Relations for MDA, shared their insights and answered questions about which conservation programs they anticipate will be impacted by the 2018 Farm Bill, and how. Extension Legal Specialists Paul Goeringer and Kelly Nuckolls Winslow wrapped up the day by giving the audience a rundown of this year’s hottest agriculture and environmental legal issues, including dicamba drift, decisions on CAFO emissions reporting, the recently-withdrawn GIPSA rules, the Des Moines Water Works litigation, and hobby drone regulations, issues which Goeringer has detailed in the Maryland Risk Management Education blog (http://www.agrisk.umd.edu). The ALEI team thanks the experts and guests who traveled from across the state and beyond to attend. Materials from the conference and and the keynote panel’s discussion of “Conservation Programs and the 2018 Farm Bill” may be accessed on the ALEI webpage under the ALEI Conferences tab at http://umaglaw.org/alei-ag-and-environmental-law-conference/. The ALEI website was recognized in November 2017 by Feedspot as one of the “Top 30 Food Law Blogs and Websites” on the web. We are honored for the recognition! Adding agritourism is a way for many Maryland farmers to diversify their operations and generate additional farm revenue. The number of U.S. farms reporting income from agritourism operations grew about 42 percent from 2007 to 2012. Welcoming the public onto farms, however, and turning a farm into a hospitality venue is not an easy venture. Farmers need to carefully consider the marketing, legal, and safety ramifications that come with starting an agritourism operation. To help farmers weigh those important issues, the Washington County Department of Business Development, Natural Capital Investment Fund, and the Conservation Fund recently hosted a three-part educational workshop series in Boonsboro, Maryland, with ALEI Senior Legal Specialist Sarah Everhart serving as one of the speakers. The first workshop in the series, held October 25, focused on models and marketing strategies and featured University of Maryland Regional Extension Marketing Specialist Ginger Myers and experts from the Washington County tourism industry. The second workshop, held on November 1, dealt with legal and liability management. Everhart began the discussion, explaining that in order for farmers to have adequate insurance coverage for agritourism, they must fully understand their liability exposure. Everhart outlined the ways adding agritourism to a farm can create liability risks and how those risks can be lessened. One technique Everhart suggested for agritourism operators to reduce liability is to have customers sign a liability waiver. She also encouraged agritourism operators to regularly inspect their operations for dangerous conditions, correct all dangerous conditions, and keep a log noting inspections and corrections. Everhart encouraged attendees to discuss with their attorneys how a business organization can be established to protect personal assets. Leslie Hart, Washington County Agricultural Business Development Specialists encouraged attendees to discuss liability risks and liability reduction strategies, such as a business organization, with their legal, accounting, and insurance professionals. The final workshop in the series, held November 8, covered customer service, food safety, and logistics. Adding agritourism to a farm often increases the need for permitting and compliance with federal and state food safety laws. For more resources pertaining to agritourism, see the ALEI website. Extension Legal Specialists Paul Goeringer and Kelly Nuckolls Winslow attended the Southern Outlook Conference in Atlanta, Georgia on September 25-27th. The conference focused on the market outlook for crops and livestock in the South. Each state’s extension team provided a brief update on the market outlook specific to their state. Goeringer provided the update for Maryland’s market outlook. The conference also included expert speakers who spoke on topics such as the status of the 2018 farm bill and calculations of land values. Nuckolls Winslow presented the “Dicamba Update” at the conference. Her presentation included background on the dicamba damage throughout the United States, an overview of state laws and regulations of the new dicamba products, the status of individual and class action lawsuits related to the new dicamba products, and legal options for both applicators of dicamba and victims of dicamba damage. Following the presentation, state extension specialists discussed the concerns with dicamba in their states. In 2015 and 2016 Monsanto started to release dicamba tolerant cotton and soybean seeds. At the end of 2016 and beginning of 2017, Monsanto, BASF, and DuPont all received approval for a new dicamba formulation with low volatility. Beginning in 2015 to today, states have received an increase in the number of complaints related to dicamba drift. Older versions of dicamba have been on the market since the 1960s. Dicamba can cause severe damage to broad leafed plants, such as nontolerant soybeans, tomatoes, grapes, and pumpkins. Goeringer posted earlier in the semester about options for victims of drift damage. He also posted about a few of the Arkansas class action lawsuits related to the new dicamba products. ALEI’s Advisory Panel, comprised of farmers, public officials, and representatives from agricultural and natural resource organizations, met at the Fisherman’s Restaurant Inn on October 5 to provide feedback and guidance on the direction and progress of ALEI. The meeting kicked off with introductions and a special welcome to ALEI’s newest advisory panel member, Maryland’s Department of Natural Resources Deputy Secretary Joanne Throwe. ALEI faculty provided the panel an update on ALEI’s outreach activities (including in-person trainings, workshops, videos and webinars), teaching, publications, and online and social media presence. These presentations covered activities since the last Advisory Panel meeting in November 2015. A critical presentation came in the form of the Agricultural Needs & Agricultural Law Needs Assessment survey and results, presented by University of Maryland Extension (UME) Assistant Director of Evaluation and Assessment Dr. Teresa McCoy and UME Agricultural Educator Shannon Dill. The survey was conducted late 2016 and early 2017, when ALEI partnered with UME educators to assess the needs of Maryland agricultural producers. The three assessments were: Eastern Shore Agricultural Needs Assessment (297 respondents), Western & Northern Agricultural Needs Assessment (172 respondents), and 2016-17 UME Winter Meetings (469 respondents over 16 counties). Early survey results showed that regulations and legislation have a moderate to high effect on the viability of the agriculture industry and farm business operations. According to Dill, “while we knew farmers were concerned about agricultural regulations, we were still surprised about the overwhelming level of concern.” The agricultural law program was seen as important to farm operations; respondents reported the most important law topics to farm operations are the environment, land-use and property rights, business liability, and farm succession and estate planning. After McCoy and Dill’s presentation, the Advisory Panel engaged in an open discussion of the implications of the needs assessment data, ways to enhance ALEI’s reach and communications, and future ALEI topic areas. Some suggestions were very simple and easy to execute, like making the Agricultural Law Section of the Maryland State Bar Directory more accessible on the ALEI website. Another suggestion was having ALEI continue to use communications as a vehicle to build trust across agriculture, natural resource, and environmental communities. ALEI was also asked to address topics like trucking regulations, Forest Conservation Act understanding and compliance, and aquaculture leasing. Last, ALEI was asked to collaborate with state agencies to better understand and address both the agencies’ and farmers’ issues. The ALEI initiative team met later in October to discuss ways to implement the Advisory Panel’s recommendations. The team has already implemented some of these suggestions and is excited to report on their progress at the next Advisory Panel Meeting in 2018. The University of Maryland’s Department of Agricultural and Resource Economics and the Agriculture Law Education Initiative will lead a special series of on-farm food safety and recall readiness trainings for farmers in January 2018. The trainings are customized for three different types of farm operations: community supported agriculture (CSA), those with on-farm markets, and those with agritourism. The trainings are supported by the Northeast Sustainable Agriculture Research and Education (SARE), a program of the National Institute of Food and Agriculture, U.S. Department of Agriculture. While each workshop will be customized to identify food safety risks for the specific types of operations, each workshop will cover Maryland Good Agriculture Practices (GAP), an overview of the Food Safety Modernization Act (FSMA), on-farm recall planning, and the role of regulatory agencies in a food safety emergency. The CSA training will be hosted by Priapi Gardens in Cecilton Maryland on January 10 from 8 am-3 pm. To register online go to https://csa-foodsafety-workshop.eventbrite.com. The on-farm market training will be hosted by Butler’s Orchard in Germantown, Maryland on January 19 from 8 am-3 pm. To register online go to https://onfarmmarket-foodsafety-workshop.eventbrite.com. The agritourism training will be hosted by Forrest Hall Farm in Mechanicsville Maryland on January 25 from 8 am-3 pm. To register online go to https://agritourism-foodsafety-workshop.eventbrite.com. All trainings are free of charge and lunch and materials will be provided.